APP compatible for above Android3.2 DVD navigation. Real man voice reminding under the condition of abnormal tire pressure. Simultaneously show 4 tires' pressure or temperature. Plug and play, easy and convenient installation. Support English, Simplified Chinese and Traditional Chinese. Tire match mode for rematch a new sensor easily. Tire exchange mode for easily replace any two tires. Adjustable high and low tire pressure alarm value. Selectable tire temperature unit: ℃, ℉. 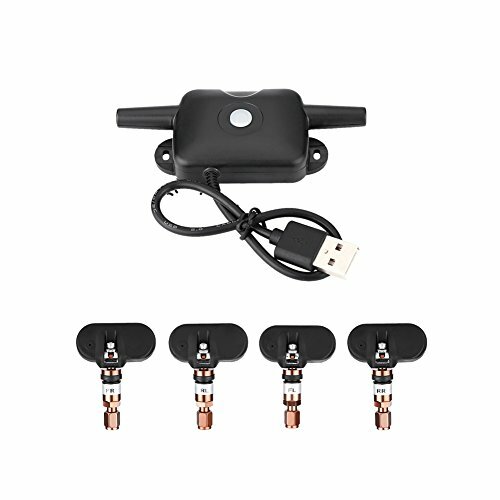 Size: 91 x 38 x 15mm/3.5" x 1.5" x 0.6"
This item is specially designed for above Android3.2 DVD navigation. You need download APP first before use. Usually, you don't need to open the APP, it can automatically pop-up windows for alarm if there is abnormal. So, users don't have to observe the tire data all the time to ensure driving safety.